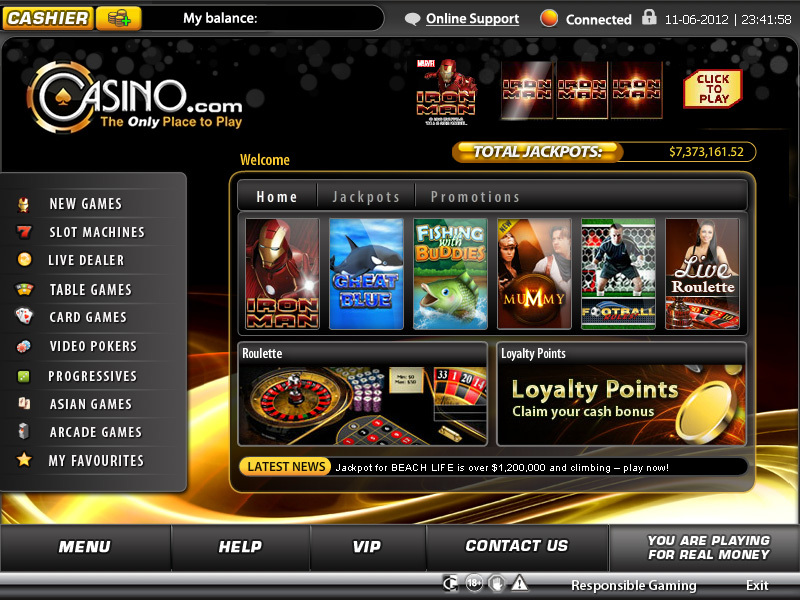 Casino.com was established in the late 1990s as a gaming establishment before refocusing on the online casino section in 2007. The domain name was acquired by Mansion Limited. 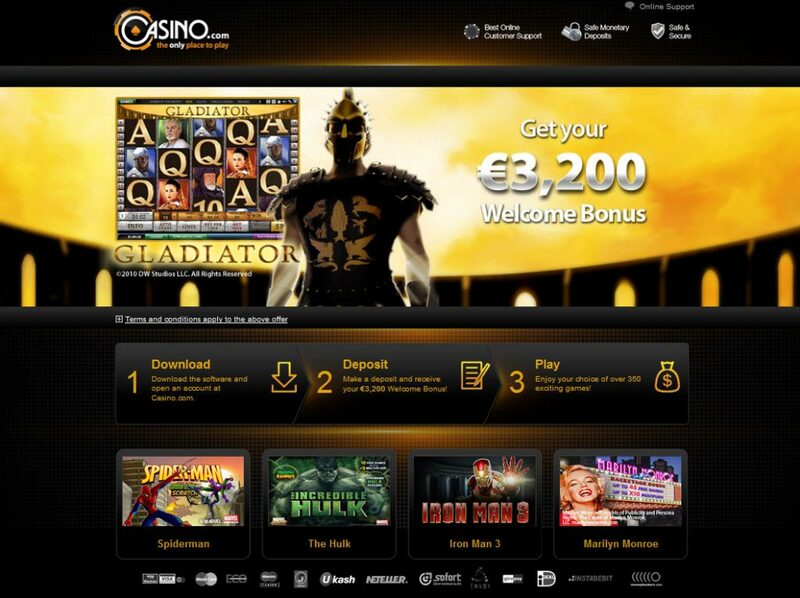 To ensure that the website and its offerings appeal to the international subscribers, casino.com has prioritized the ease of access and the convenience level of their customers. The casino client is powered by industry top shot, Playtech, a highly reputed gaming software developer. Due to Playtech’s experience in this field, the feel of using the casino client at casino.com is quick and fun. The lag tendency is negligible especially the rate at which the games load. As a matter of fact, players with very strong internet connection are assured of no downtime. Players have access to both downloadable casino software and a flash-based alternative where games can be played directly from a web browser. The software is intelligently designed to ensure that once it is installed, the player has a dedicated casino on his desktop which provides easier access to his/her favorite games. It is also important to note that the full complements of games available on the flash version are present on the downloadable software. In a forward thinking move, casino.com came up with a mobile application that runs on both iOS and Android platforms to carry along players between the late teens and middle age who are constantly attached to their mobile devices. There are several games available at casino.com in fact they are in their hundreds. The most common of the games are obviously slots. However, sifting through the array for the one that best suits you couldn’t be easier especially with the way the games have been sub-categorized using style theme and a couple more parameters. At casino.com, the watchword is customer satisfaction and usability, right from the homepage which is designed to be user friendly without the usual complexities associated with many competing sites. Whichever you decide to opt for between the instant or download, you will find out that the enjoyment is second to none. There is a side bar that displays a breakdown of the available games into categories and once a category is clicked upon, the games listed under the categories are instantly displayed on the front page for the user to pick from. In a bid to reach out to customers across several countries and nationalities, they have designed the casino to bring about breathtaking experience in more than 30 languages. For a site that is hoping to reach out to as many people in as many countries as possible, it is not surprising to know that their approved payment methods are almost limitless. Standard payment methods using cards like Visa, Mastercard, Maestro ensures that players can make payments from even the remotest part of the world. Virtual cards like Paysafe, Entropay and Ecocard are also accepted. There is also the option of using a direct bank transfer or even systems like Citadel Internet banking. The full complement of eWallet options like UKash, Click2Pay, Click and Buy, Skrill and Neteller are also available. These payment methods were painstakingly put in place so that not been able to make payments or thereafter withdraw winnings is not the reason why you will decide not to using casino.com. It is quite unfortunate that even in this day and age, many players are not making the most of the premium casino bonus codes however, if you choose casino.com, you can now enjoy their mind blowing $3,200. Once you are ready to play, you must familiarize yourself with the process that will most likely bring one of the biggest bonus offers in the online casino industry. First things first, there is an exclusive CardsChat.comTM bonus code that is required to enjoy the bonuses offered on casino.com. The code is CC3200. However, the knowledge of the code is barely enough to inch closer to the kitty so to use the information which you now have, you will have to log on to casino.com and navigate to cashier. From this point you will be walked through the process of making an initial deposit using any of the methods we discussed under “Payment and Withdrawal”. Now, before concluding the payment, be sure that the bonus code has been carefully entered into the promo code box. You should note that any errors will disqualify you from winning bonus. Early this year, casino.com restrained from issuing a $3,200 single bonus, they instead opted for a collection of eight 100% match promotional offers each worth not less than 400$. Combine all eight together and you might still hit the 3200$ jackpot, Casino.com just want to ensure that their cash goes to the loyal and consistent players.